This battery operated torch and flashlight is moulded into the shape of Captain Scarlet. Standing at 7.5 inch in height, this figure of the popular television character has jointed arms and legs. 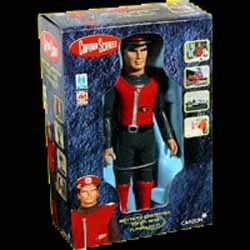 A battery operated torch and flashlight are incorporated into the figure with the lens in the top of Captain Scarlet's hat. The great thing about this item is the fact that it actually looks like a toy action figure, and kids will probably love playing with it as well as using it as a torch. It is incredibly detailed and I'm sure that many Captain Scarlet fans, both young and old alike, will want to add this to their toy collection. While you may not have previously thought of Captain Scarlet and flashlights in the same sentence, this toy may well shed light on why we think this is a winning combination.